Northern Ireland has the worst fuel poverty levels in the UK. Our local Church Action on Poverty group in Northern Ireland is building partnerships and providing much needed practical assistance. According to the Northern Ireland Fuel Poverty Coalition, around 300,000 households in Northern Ireland cannot afford to heat their homes. Northern Ireland has the highest prevalence of fuel poverty in the UK and one of the highest in the EU; the most recent estimates indicate that 42% of households are experiencing fuel poverty. It’s against this backdrop that the NI branch of Church Action on Poverty launched its ‘Heat or Eat’ Campaign in 2010. Focusing on the South Antrim area, where most of the NI branch committee members live and work, the campaign was a response to what we were hearing ‘on the ground’. The shocking reality for many families living in the South Antrim area is they face the stark choice each winter of heating or eating. Moreover, the increasing cost of home heating combined with rising living costs places many individuals and families in a desperate predicament. As Christians from across the denominations, we were very much aware of our duty to help the vulnerable among us, many of them hidden and voiceless. Church Action on Poverty NI’s campaign is therefore grounded in the biblical injunction exemplified in 1 John 3:18 to demonstrate Christian care in action: ‘Dear children, let us not love with words or tongue but with actions and in truth’. Our campaign, which essentially asked local churches, businesses and concerned individuals to contribute to a central fund, raised a modest amount in the first year. Donations were received from Presbyterian, Anglican and Baptist churches and community groups among others. Our aim was, and still is, simple: to provide gifts of heating oil, gas and electricity to those most in need. Moreover, we had the specific aim of enabling local people to help local people in need over the Christmas/New Year period. In order to do this most effectively, Church Action on Poverty NI built a coalition of partners to help raise funds, administer the scheme, identify needy families and to distribute grants. Our particular focus in the early years was to help struggling vulnerable young families. Today, our coalition of partners includes Citizen Advice Bureaux (Antrim and Newtownabbey), the Newtownabbey Methodist Mission, Home-Start Antrim and local MLA Danny Kinahan. 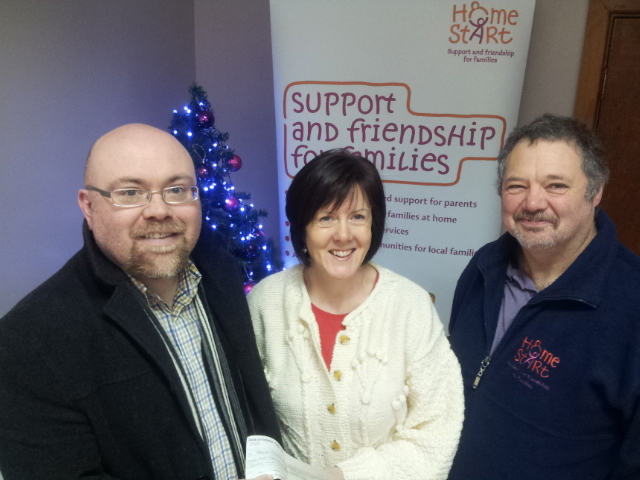 In addition to identifying needy families, the CABs offer benefit checks for people involved in our scheme, while Home-Start has particular expertise in working with young families. Mr Kinahan has been invaluable in raising funds and in increasing the profile of the campaign among the local business community. Given the success of the ‘Heat or Eat’ campaign to date, we look forward to continuing to raise money and build partnerships during 2014. The problem of fuel poverty, as we and our partners experience it on the ground, is not going away; with more money we could do even more in our local community to help those people who desperately need it. But there are, of course, wider policy implications for our legislators and representatives. Fuel poverty is an injustice that requires concerted cross-party efforts, both in Northern Ireland and across the UK. 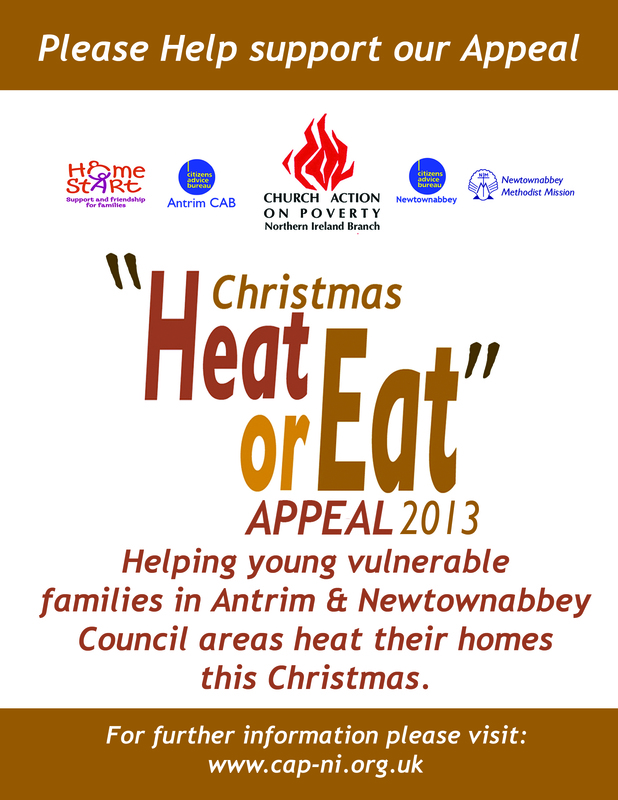 Church Action on Poverty NI will therefore continue to lobby our local and Westminster politicians on this issue, as well as running our ‘Heat or Eat’ campaign, and we look forward to making substantial progress on both fronts. Church Action on Poverty is campaigning for people on low incomes to pay Fair Prices for energy, as part of our ‘Food, Fuel, Finance‘ project. This entry was posted in Fair Prices, Fuel poverty, Local groups, Partners and allies, Uncategorized by Church Action on Poverty. Bookmark the permalink.